I’ve been frustrated this summer about not finishing my creative projects. I have a bunch of ideas I want to pursue but can’t seem to get anywhere. I knew that one problem was the fact that I had so many things that I was dabbling in. You can’t move very far forward if you keep changing paths. Also, I couldn’t blame time, I had the time, but I lacked the motivation to get to work. On a recommendation, I downloaded the book “Eat That Frog! : 21 Great Ways to Stop Procrastinating and Get More Done in Less Time” and it immediately resonated with me. Not only does the book address the things holding me back, but the author presents clear strategies to overcome this. Just reading a few pages motivated me! Number one: I needed to define my primary goal, which is to continue revamping my online art shop. Once I identified this as the primary goal, and other projects as less important, I was motivated to attack the list of to do items (I already had). And once I accomplished one thing on the list, I was motivated to attack several other items – just as the quote above states. Ironically this feeling, of being pulled in several directions and not finishing anything, isn’t new for me. In fact, when I started this blog (My Creative Resolution) it was my #1 problem. Having the blog, held me accountable – I felt I had to finish a project (or at least move forward) so I had something to post. And I was motivated to spend the first month or so pulling out old projects and finishing them. It was very cathartic, very satisfying, and very motivating. I feel that way now, I’ve accomplished a lot with my online shop and am just waiting for new prints to come in. While I wait my mind is clearer to move onto the next priority – finishing my latest acrylic seascape painting. Prioritizing has helped me focus tremendously. Categories: creative habits, Inspiration | Tags: Art, creative habits, creativity, procrastination | Permalink. A New Year’s Resolution – Heading into Year 5! It’s hard for me to believe that 4 years ago – at the start of 2014 – I made a New Year’s Resolution to be creative. Before that I was creative off and on, often while taking a class, but never consistently. I wanted to be creative on a regular basis and find what interested me. I was open to any type of creativity, exploring was going to be part of the fun. I thought I might get into furniture refinishing. Starting this blog, that I called “my creative resolution,” was to hold myself accountable – even if no one was reading. 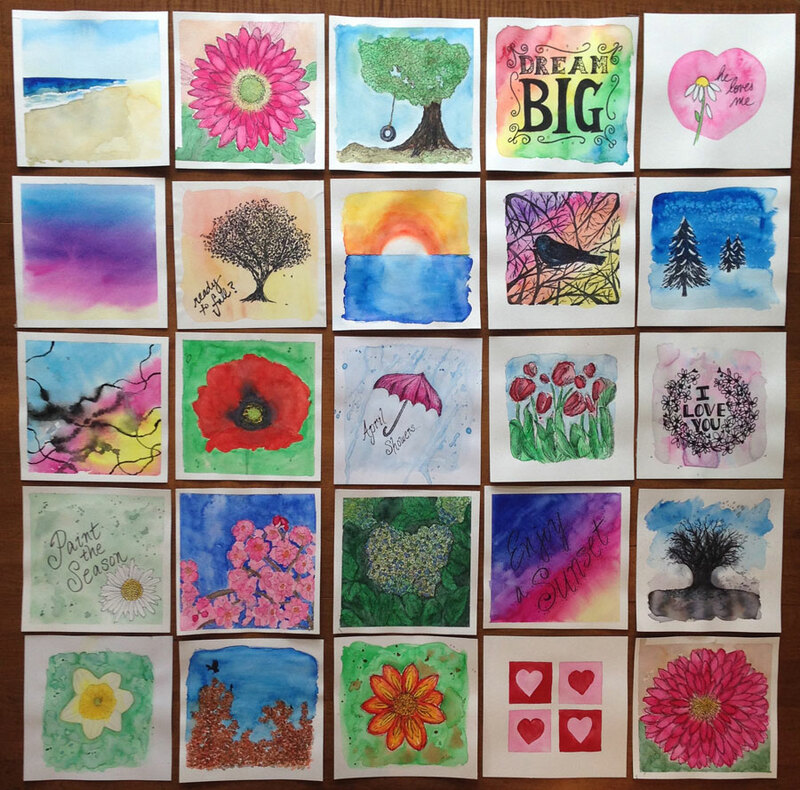 Although there have been ups and downs, and at times I even thought of stopping – this blog and regular creativity have brought tremendous joy to my life. I pushed myself to complete things, and achieve goals that I never would have without it. I’ve always found that the periods right after thinking about stopping, were hugely productive and creative. That first year, I started with acrylics, but quickly went back to watercolors, realizing how much I love painting in watercolor. I love that you can’t fully control the results and have to go with the flow. 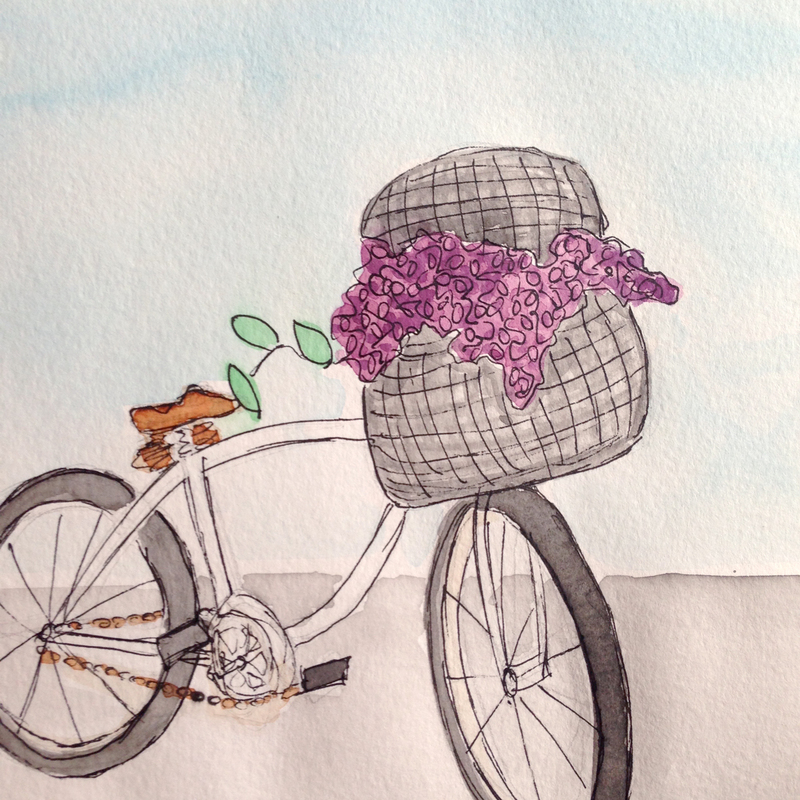 Even though I’ve tried other mediums, watercolor is definitely my medium. I started 2017 with the project of “painting the beach.” The beach has always been a special place to me – I grew up in a beach town, played there, worked there, and now live just 15 minutes away. As I started to have success with capturing the water, I felt I had found my thing. For most of the year I concentrated on painting the ocean and will continue this in 2018. You can see many of my ocean watercolors and purchase prints at shop.eileenmckenna.com. Take a peek! 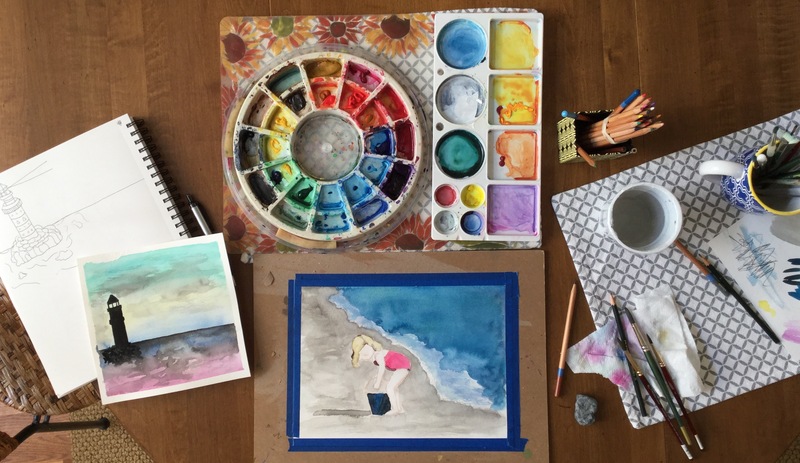 As I begin the 5th year of my creative resolution – I’m excited and hopeful. I know that when you put in the time and work amazing things are possible! Happy New Year! Want to see my tips on keeping a resolution? Read 9 Tips to Help You Keep Your New Year’s resolution. Categories: Resolution | Tags: Art, creative, New Year's resolution, resolution, Resolutions | Permalink. I realized this weekend how discouraging it can be to be a beginner. I worked on two very different projects for me. One was a paper diorama. 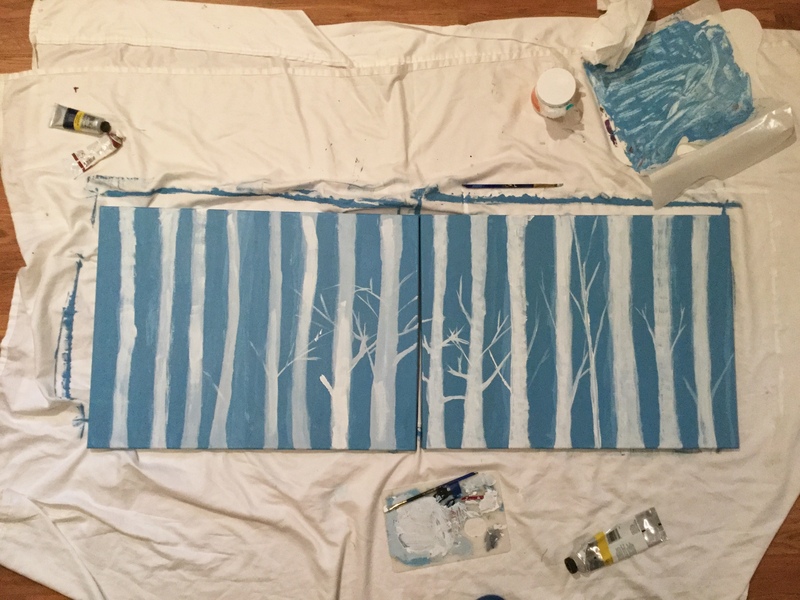 The other was painting two canvases with acrylics. I realized this morning that all these feelings were related to being new to something. Thankfully, I had the perspective of the two very different projects. Otherwise I would have thought, “I’m not good at that.” When I looked over at my watercolor setup this morning, I saw all the things these past years have given me – routines, methods, techniques, the right tools, etc. These things make it easier to sit down and create comfortably and not let self doubt in (as much). If I continue with acrylics or dioramas or any other new thing, over time things will get better and easier. If you are a beginner – don’t give up! Allow time to work out the kinks. Then you’ll have a comfortable “space” to freely create. Categories: creative habits | Tags: Art, Beginner, creative, Creative setup, creativity | Permalink. The kids are back at school and the house is quiet. It’s the perfect time to get back to painting. Once I set up, I accomplished a lot in a short amount of time. Categories: Watercolor | Tags: Art, beach, Lighthouse, painting, watercolor, worldwatercolorgroup | Permalink. It feels really good to have time to paint and draw after vacation (and the time before it – shopping, prepping, and packing). I spent time Sunday starting several paintings. For me, it’s the starting that’s hard, once I have a painting “in the works” it’s easy to pull it out and work on it (unless I let too much time pass). The three paintings were very different. You’d never guess I started them all at the same time, but they did have something in common. Before I started painting I turned to my Camera Roll on my phone for inspiration. All three were inspired by recent photos I took, or in one case, a photo I spotted on Instagram (that I took a screen capture of). 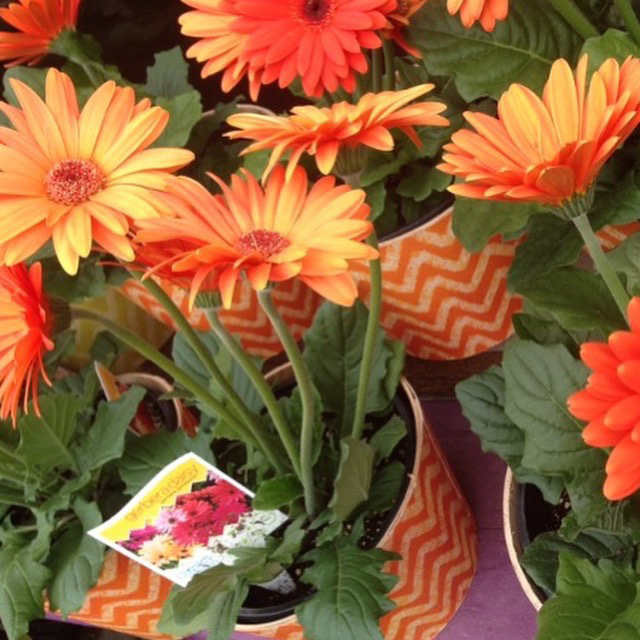 The orange gerbera daisies (my favorite flowers) were outside of the supermarket. 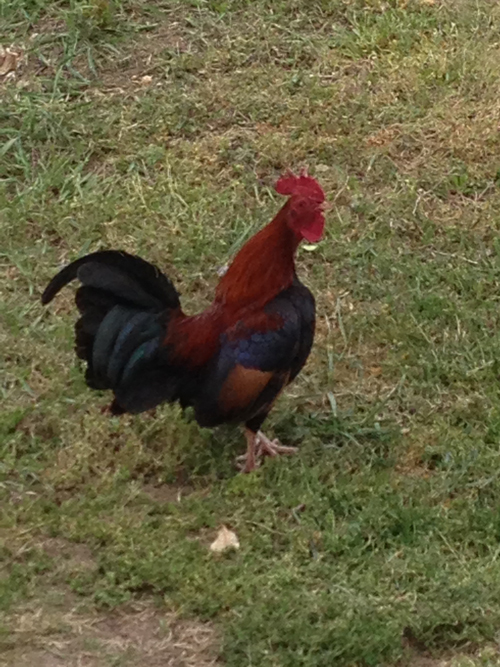 The rooster roams around outside of my son’s friend’s neighbor’s house. Who knew you could find a rooster this close to NYC? 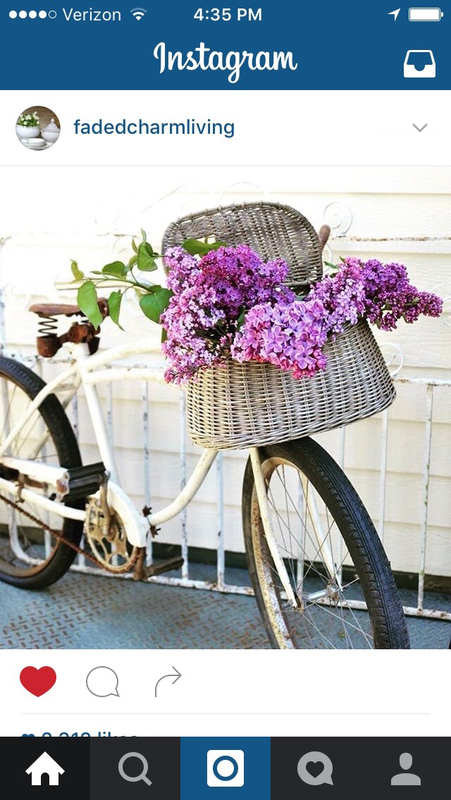 The vintage bicycle with the lilacs was posted on Instagram by Kathleen @fadedcharmliving. I’m trying to paint more. I had gotten away from it a bit. 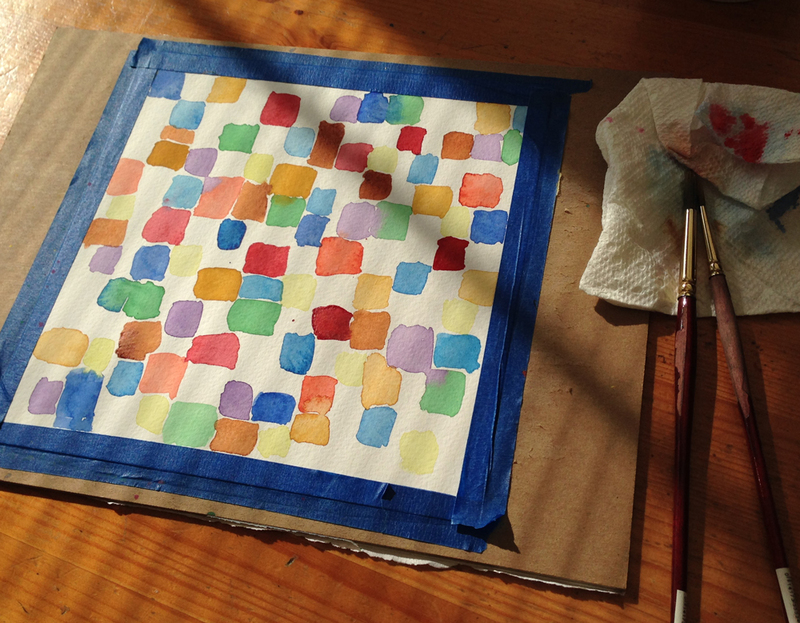 Not that long ago, I painted in this square size so frequently I put all the painting together and took a photo. 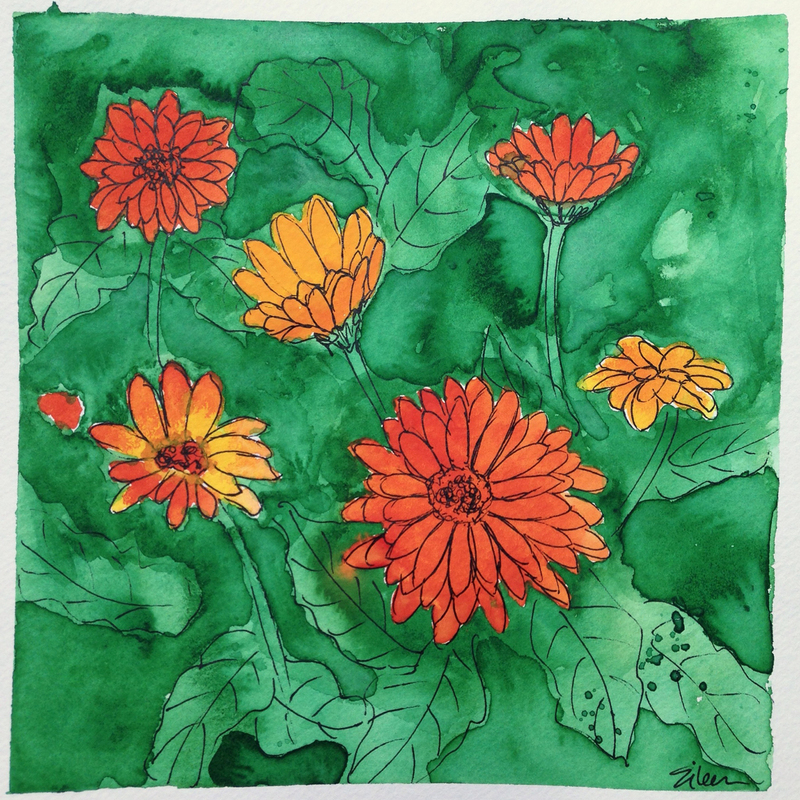 My goal is to create another grouping of square paintings. I have a ways to go! 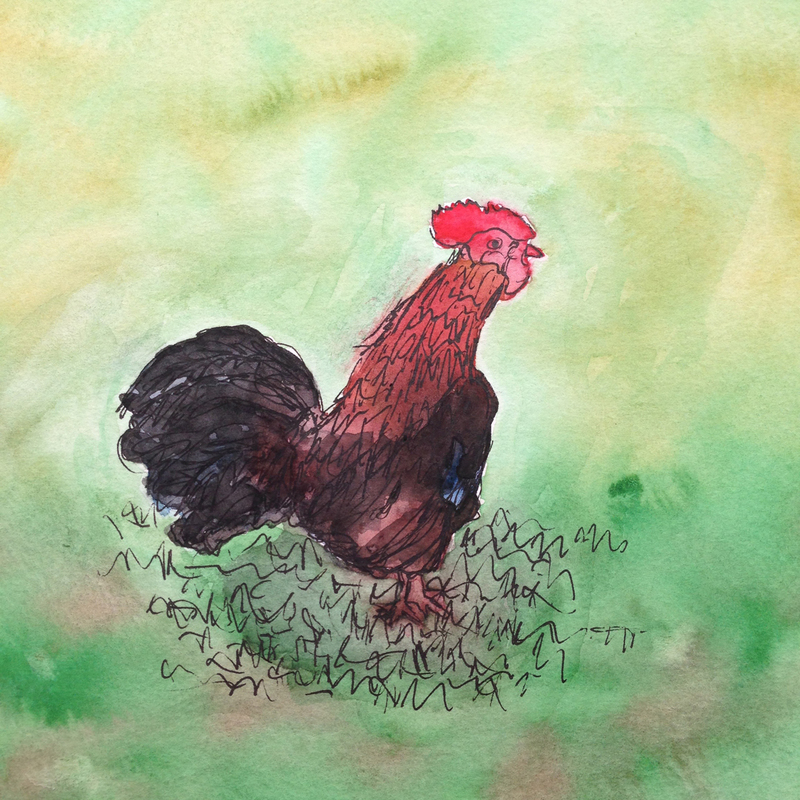 Categories: Watercolor | Tags: Art, art projects, daisies, inspiration, painting, rooster, watercolor | Permalink.